Need to use up all the vegetables in your crisper? This is a great recipe to use as a base. Feel free to substitute whatever vegetables you have in your fridge. Chop onions, celery, carrots and saute in pot with grapeseed oil for 5 minutes. Cut beef into 1/4 inch cubes and add to pot. Cook until no longer pink. Add minced thyme, soy sauce, and Worchestershire sauce to pot and cook for 5 minutes. 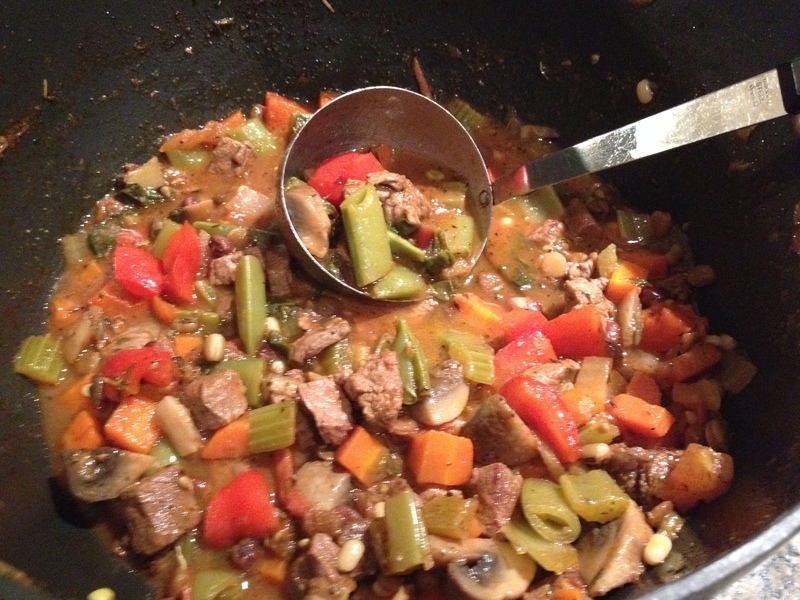 Chop in large chunks the red pepper, mushrooms, sugar snap peas, tomatoes and add to pot. Cook for 5 minutes. Add chopped swiss chard along with tomato paste and stir into mixture. Add chicken stock and water to mixture along with lentils, Italian seasoning and salt and pepper. Adjust the seasonings as preferred. Serve with a sprinkle of parmesan cheese, a side salad and warm whole grain buns.